Print custom watermark on plastic cards. Printing custom watermark on ID card printer. Watermarks are designs (visible and invisible) that are put onto the media during production that allows another level of security. By including a watermark into the design the card increases the security & difficulty of reproduction and fraud. 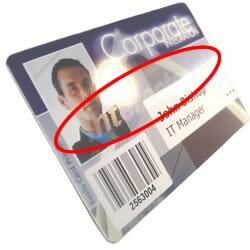 Evolis ID card printers can produce watermarks on the printed plastic card. Paper watermarks are created by making the layer thicker or thinner than the rest of the card whilst the pulp is still wet, hence watermark. Printing a card with a custom watermark is cheaper than having to invest in custom holograms. With our range of plastic card printers, we have the ability to customise the watermark to your specification. The watermark is only visible when held in certain angles of light. Once the card is tilted into the light, more information is visible. The watermark can be text or a simple design. You can increase the security of your current ID cards with this alternative to producing your own custom holograms which are prohibitively expensive.